This depends on a variety of factors: the rail operator, the train type, and whether your bike is dismantled and put in a bike bag, or if you want to transport it fully assembled. If your bike is stored in a bike bag and it does do not exceed 120 x 90cm then it will count as luggage. For a normal road bike, these conditions are usually met if you take out the wheels and turn the handlebar before putting it in a special bike bag. This bag can fit into the luggage storage area found at the end of each carriage. If you have a folding bike (such as this one) then SNCF will see it as conventional luggage, even if it is not stored in a bike bag (housse). If you are planning on transporting a dismantled or folding bike, then you can purchase a regular train ticket with Trainline (one which does not include a bike reservation). Please note that this only counts for trips within France and not international trips such as Paris - Barcelona (click here for more information). TGV and Intercités trains (with seat reservation). Reservations for assembled bikes are absolutely compulsory for these trains and cannot be added after a ticket has been purchased. If you purchase a ticket which includes a bike reservation, then you will be able to sit next to your bike. So it is for this reason that bike reservation holders cannot sit together with passengers who do not have a bike reservation. This also means that the passengers without a bike will have to make a separate booking. I can’t see a reservation option for my bike? If you do not see an option ( pictured above) to reserve a space for you bike, then unfortunately it will not be possible to take an assembled/non-folding bike on board that particular train. The majority of the Sud-Est TGV line cannot facilitate bikes. This includes trips from Paris to Lyon and Marseille for example. For these routes, the best option is travel via TER (regional) train via Gare de Paris Bercy or disassemble the bike and stow in a bike bag (then it counts as luggage). For Avignon, there are now trains going to Avignon Centre that accept fully assembled bicycles. For these types of trains, you can purchase a regular ticket with Trainline and do not need to pay a bicycle surcharge. As reservations cannot be made, the ticket inspector is allowed to deny your bike access if all of the spaces are taken. However this is a rare situation and will usually not arise. If you don't see the bike compartment option, it means the train doesn't take them. We also sell bike reservations for non-dismantled bikes for the French sleeper trains. This means there is a dedicated bicycle storage area with limited space available. Please note: it is only possible to book a bike space if you are booking a couchette. It is not possible to reserve a bike space for reclining seats. This is because only the couchette carriages have the bike spaces available. It is also possible to have your bike shipped through SNCF’s luggage service. Though be aware, it can be very expensive and will cost a whopping €80 which can end up costing more than your actual ticket. To ship your bike, all of the necessary information can be found here. Unfortunately this service is not bookable through Trainline. then Eurostar will consider the bike as conventional luggage. If your bicycle does not meet these conditions, then you should first purchase a ticket with Trainline and then contact Eurostar to reserve a place for your bike. There will be a service fee included. All of the necessary information can be found here. Even though the initial ticket reservation does not go through Eurostar, they are still able to place a bicycle reservation for you. Lyria trains do not have a bike storage compartment and only allow dismantled/folding bikes stored in bags, as they count as conventional luggage. Thalys trains do not have a bike storage compartment and only allow dismantled/folding bikes ( stored in bags), as they count as conventional luggage. The dimensions of the bag must not exceed 120cm x 90cm. Renfe-SNCF trains (Paris - Barcelona line) do not have a bike storage compartment and only allow dismantled/folding bikes ( stored in bags), as they count as conventional luggage. The dimensions of the bag must not exceed 120cm x 90cm. Deutsche Bahn offers plenty of options for cyclists. Some trains do require a reservation whilst others do not. Unfortunately we cannot yet facilitate these bookings, so you will have to make a reservation directly with Deutsche Bahn. You can find all of the important information here. Unfortunately no bikes are allowed to be stored in the hold compartments of OUIBUS buses. This includes both assembled and folded bikes. Bicycles are strictly forbidden on board unless they are dismounted and stored in a transport case (bike bag). In this case, the bike is then considered as an item of luggage and forms part of the luggage allowance of 2 standard size suitcases measuring less than 160 cm (height + length + width), including hand luggage. Bike bags of dimensions greater than 160 cm are not allowed on board. We can currently not facilitate any bike reservations for Trenitalia regional trains. If you wish to take on board an assembled bike, you will have to make your reservation directly with Trenitalia. 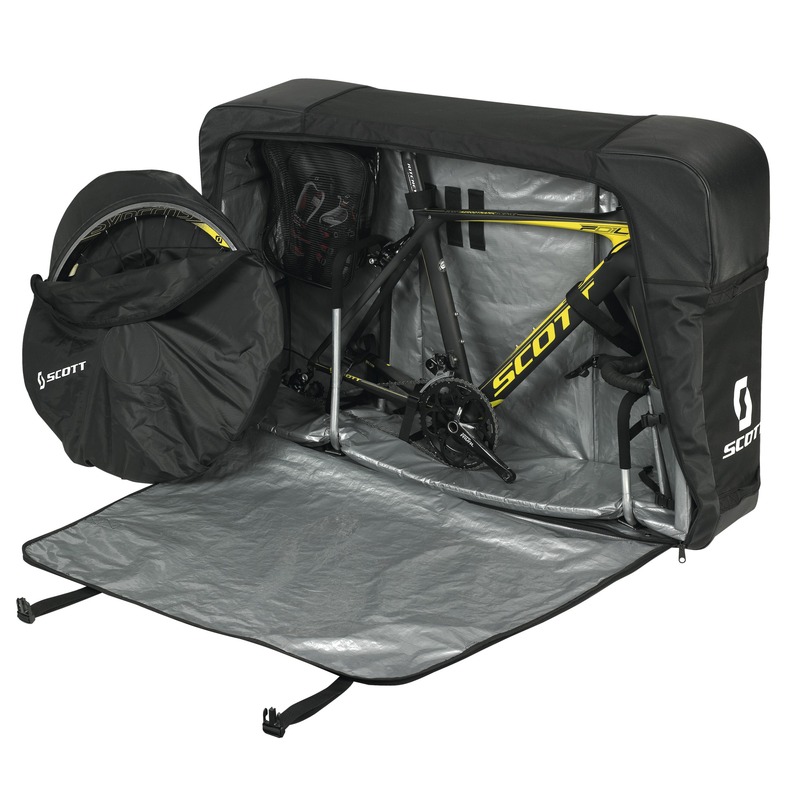 If you wish to take on board a folded bike, you are able to do is when travelling in second class and the bike must be stored in a bike bag (housse). On all domestic trains you can carry your bike for free when it is folded and stored in a bike bag. The bike will have to be placed in the allocated luggage compartments found in each carriage. In case of lack of space, you can place it elsewhere as long as it does not create a safety hazard or block any other passengers or seats. Any bike that can be folded into a bag can be taken on board Italo trains, free of charge. Please note that the maximum dimensions are 120 x 90cm. As Italo has a luggage allowance of two pieces of luggage plus hand luggage per person, a bike bag will count towards this allowance. Folded or dismantled bikes do not require a bike reservation and may be transported as conventional luggage. Please note: this does not apply to sleeper (night) train services. A bike reservation is required and must be made directly through Renfe. This reservation is free of charge. The bicycle is folded or dismantled and stored in a bike box or house. The dimensions must not to exceed 120 x 90 x 40 cm (length-height-width). The pedals must be removed and the handlebar turned to 90º. On Medium Distance, Suburban and Metric Gauge trains, folded bicycles do not need to be transported inside a carrying case. They may be stored in the luggage areas at the end of each carriage. Unfortunately we are unable to sell bike reservations for Renfe trains. Instead reservations for bike spaces can be made directly through Renfe. NS allows you to bring collapsed folding bicycles on the train free of charge as long as they fit in the luggage racks and do not black other passengers on the train. Modified bikes provided under the Social Support Act (WMO) may be taken free of charge without a Special Permit. These bikes cannot not exceed 150 cm x 75 cm. Between 09:00 and 16:00 and between 18:30 and 06:30 on weekdays and all day on weekends, fully assembled bikes, tandem bikes, and recumbent bikes or disassembled racing bicycles can be brought on the trains but require a special bike ticket. This ticket costs €6.20 and can be purchased on the NS website or directly at the station. We do not sell NS bicycle tickets at this time. SNCB allows you to bring collapsed folding bicycles on the train free of charge as long as they fit in the luggage racks and do not black other passengers on the train. Fully assembled bikes can be brought on the trains but require a special bike ticket. This ticket costs €5 for a single journey or €8 for a day ticket. SNCB bike tickets can be purchased on the SNCB website or directly at the station. We do not sell SNCB bicycle tickets at this time. You must purchase bike passes or bike tickets directly through SBB by phone by calling 0900 300 300 (CHF 1.19/min.). We do not sell bike tickets for SBB at this time. DSB allows you to bring collapsed folding bicycles on the train free of charge as long as they fit in the luggage racks and do not black other passengers on the train. On DSB trains, you are allowed to bring wheelchairs, prams, and bicycles, but you must make the reservation with DSB by telephone on: +45 70 13 14 15. LEO Express allows bikes but tickets must be purchased directly through them at the same time that you make your booking. We do not sell LEO Express bike tickets at this time.